Driving south-west from Crested Butte on US 50 to CO 347 it took us an hour and 45 minutes to reach the main entrance of the park. Along the way, I had my first glimpse of the Gunnison River that flows through the canyon. The first stop in the park, Tomichi Point, shows the impressive, steep, deep and narrow canyon. 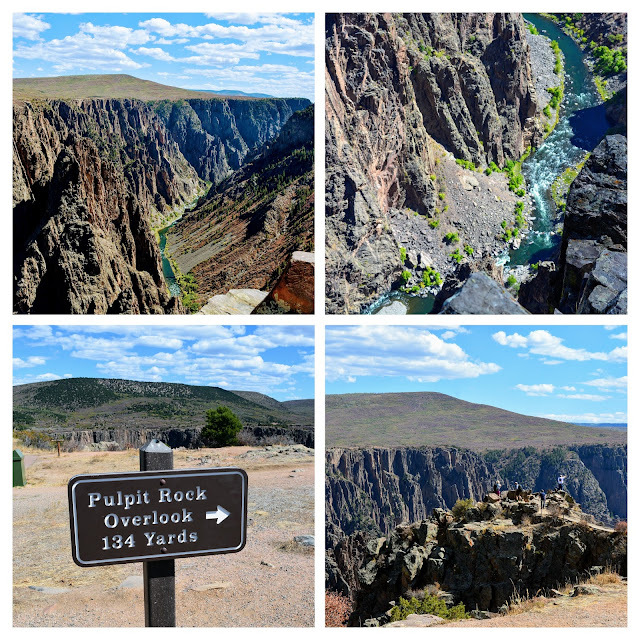 The park protects the deepest 14 miles of the Black Canyon gorge, about 75 miles upstream from the Gunnison's junction with the Colorado River. A placard at this stop shows the eleven more viewpoints that are ahead in the park a total 6-mile drive. The first viewing platform in the distance, as seen from the park's visitor center window. At the visitor center, we enjoyed seeing exhibits and a movie about the Black Canyon of the Gunnison and the history of its explorers and the attempts to navigate the Gunnison River and build a railroad at the bottom. You can read more about the canyon's history on this link. At each of the eleven stops, there is a trail leading to a viewing platform that allows for safe spectacular views down into the canyon. 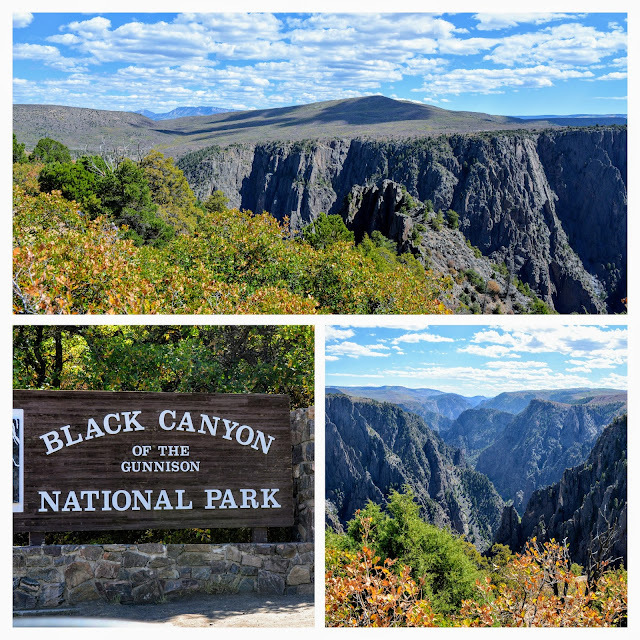 Black Canyon of the Gunnison exposes you to some of the steepest cliffs, oldest rock, and craggiest spires in North America. With two million years to work, the Gunnison River, along with the forces of weathering, has sculpted this vertical wilderness of rock, water, and sky. The Black Canyon is so named because its steepness makes it difficult for sunlight to penetrate into its depths. As a result, the canyon is often shrouded in shadow, causing the rocky walls to appear black. At its narrowest point, the canyon is only 40 ft (12 m) wide at the river. The canyon has some of the world’s oldest exposed rock — Precambrian or “basement” rock that is nearly 2 billion years old! My husband peering over the side at one of the viewpoints. Each stop along the way is named and has the length of the trail leading to the viewing platform. All of the stops are along the south rim of the canyon, There is no bridge crossing over the canyon and road access on the north side is very limited. The Painted Wall section of the Black Canyon of the Gunnison is the tallest sheer cliff in Colorado at 2,250 feet (690 m). Lighter-colored pegmatite dikes are clearly visible in the rock walls. The Gunnison River drops at a far steeper pace than the Colorado River in the Grand Canyon. At its steepest part, the river drops 240 feet per mile. The elevation of the top of the rim of the canyon is almost 8,000 feet, and the canyon descends 2,000 to 2,722 feet above the swift and turbulent Gunnison River below. That depth is near twice the height of the Empire State Building! You can see mountain ranges in the distance from portions of the rim. There are unmaintained hiking trails on the north and south rims of the canyon, which take about two hours to hike down, and four hours to hike back up. All inner canyon descents are strenuous and require Class 3 climbing and basic route finding skills, plus an official permit. Most visitors to the park view the canyon by the various scenic overlooks. On this visit, we were able to drive down to the Gunnison River by taking the East Portal Road inside the park. This provides access into Curecanti National Recreation Area where camping, picnicking and fishing are available. The road is extremely steep --16% grades--with hairpin curves. ...until we reached the banks of the Gunnison River. ..and admire the views looking up! There are trails to hike on the bottom of the canyon, but they require permits and more time than we had. ..and knowing we had an almost two hours drive back to Crested Butte, we left the area to return to the town for a late dinner. We were so happy that we were finally able to see the entire national park from the south rim and the bottom up. It certainly was one of the most unique parks we have ever visited! On my next post, I'll show you the Blue Mesa and the very unusual topography of the Curecanti National Recreation Area that we passed along the way. 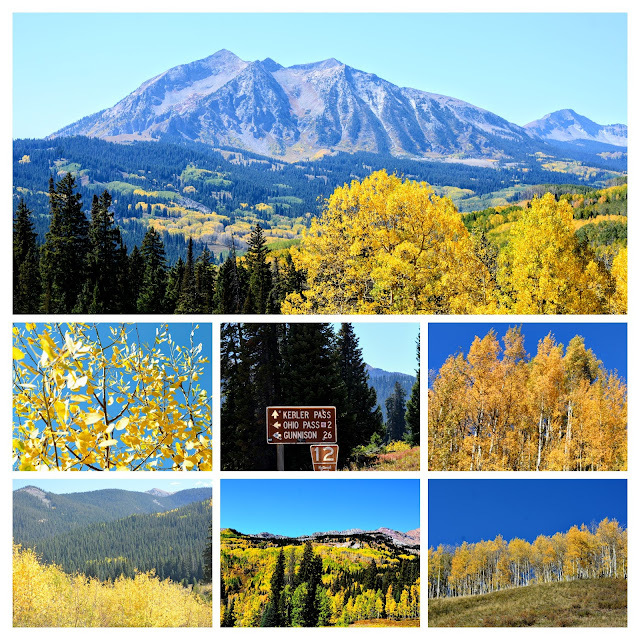 Towards the end of September, my husband and I celebrated an anniversary by taking a sightseeing drive to Crested Butte, Colorado -- click here and here to read those posts. While we were in that area we also took a drive on part of the West Elk Loop Scenic Byway, passing over Kebler Pass. Last October, we drove over the West Elk Loop Scenic Byway from another area, beginning in Carbondale, Colorado. and passing through Redstone, Marble and over McClure Pass. You can read that post here. That part of the byway had such spectacular views! This part of the byway began in Gunnison, passing through Crested Butte, and over the very rustic gravel road of Kebler Pass. 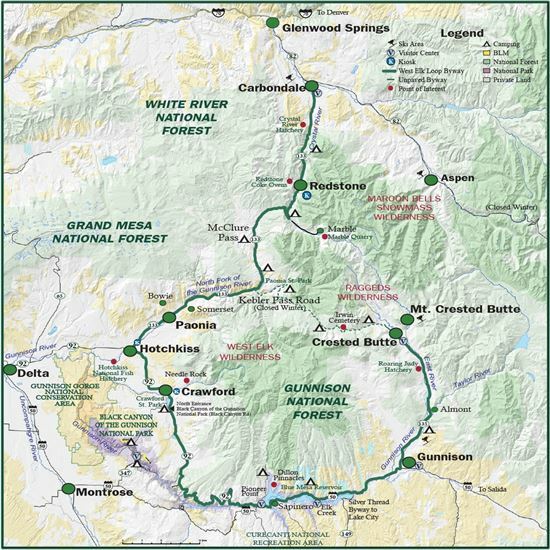 Above is a map showing the entire West Loop Scenic Byway, seen in the green circular line. The entire byway is 205 miles long and the suggested time to drive it in its entirety is eight to ten hours. The section of the loop that is Kebler Pass is only open seasonally and is usually closed November to April or May. The West Elk Loop derives its name from the West Elk Mountains, which the loop circumnavigates, and it passes by four diverse wilderness areas. Determining when peak color occurs in autumn in Colorado can be a guessing game. As you can see by the photo above, in late September in Crested Butte one tree was in full color while the one standing next to it is just beginning to turn. Usually, northern parts of the state and higher elevations begin to show color in mid-September, and then the color moves down the state and down in elevation until late October. Variables, such as rain or snow or bitter frosts can change the timing. 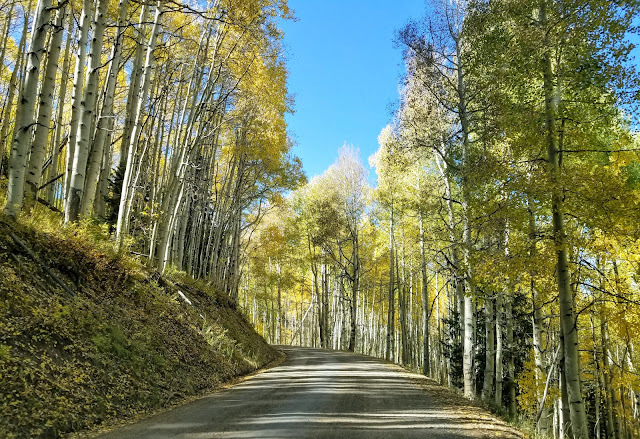 We felt we might be a little early to see full peak color in the Crested Butte area, but we were pleasantly surprised to see quite a bit of it. 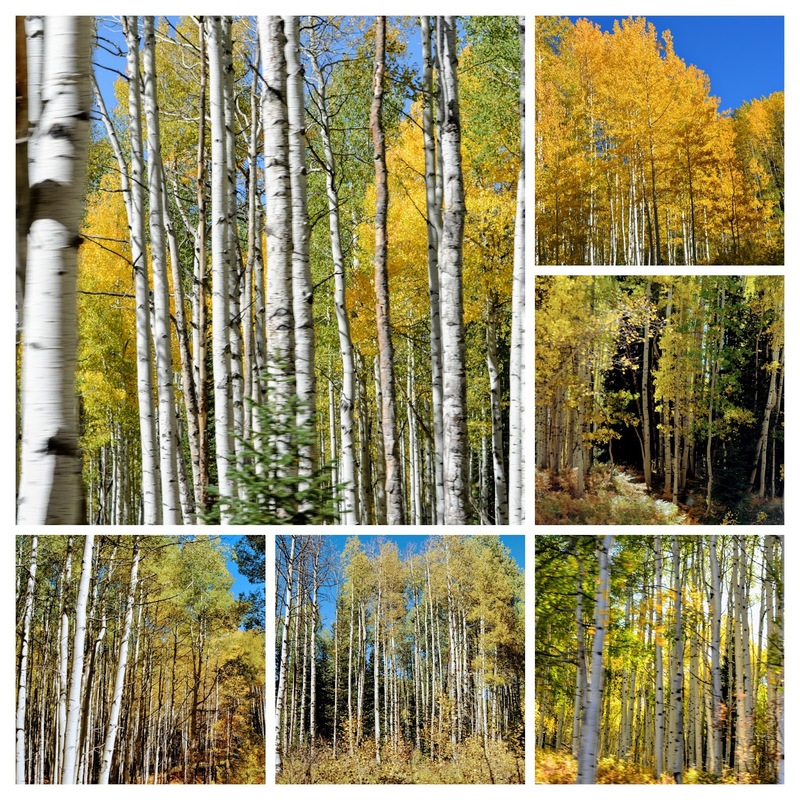 In fact, we saw many aspens in shades of yellow and orange and there were hardly any clouds in the sky on our drive. Even in areas without much autumn color, the views were spectacular! The aspen tree is a unique organism that produces clones from common root systems and reproduces rapidly to cover vast areas. The forest is made up of many thousands of clone colonies. ...on the twisting and climbing gravel road over the pass. They were the tallest aspens I ever saw! 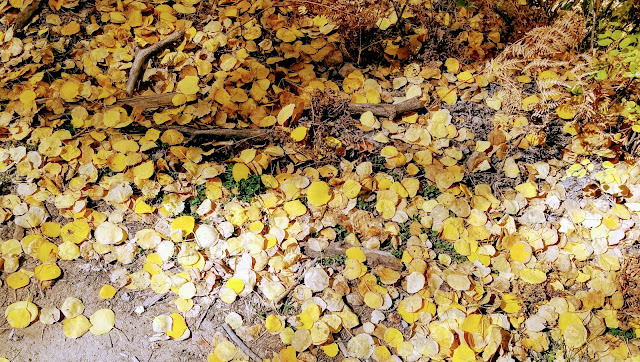 ...with carpets of golden aspen leaves under my feet. 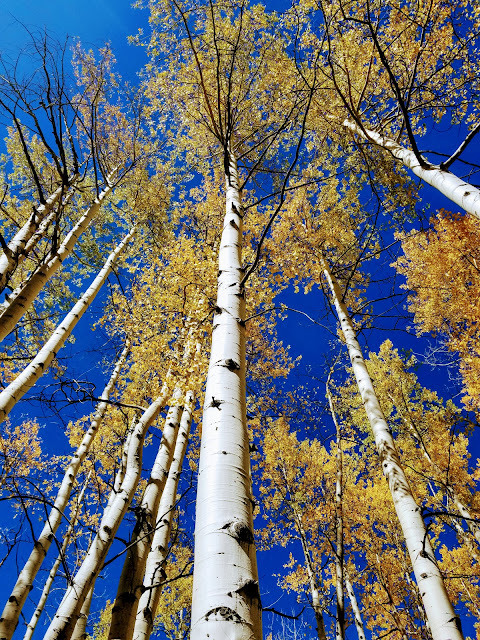 Such tall aspens that only their upper branches still had leaves! Aspens that almost looked as tall as the mountain! ...as well as National Forests thick with pines and aspens as far as the eye could see. A short video of the wind making the aspen trees quake and some of the scenery. To view on my Mille Fiori Favoriti facebook page, click here. So although we did not completely drive the entire West Loop Scenic Byway, between last year and this year we did the majority of it and enjoyed every mile! It is particularly beautiful in autumn, and I'm so happy to have seen this part of Colorado. Hopefully, we will be able to return many more times. We made one more drive while in this area, to the Black Canyon of the Gunnison National Park--come back next post to see our visit to this very unique canyon.